RAMADAN MUBARRAK to all my readers. 1. Take flour, salt and oil in a bowl and mix well for 3-4 min. 2. Then add water to make it into tight dough. Knead well for 5 min. Let it sits for 10 minutes. 3. Divide into 4 balls. Roll each ball into thick bread. 4. 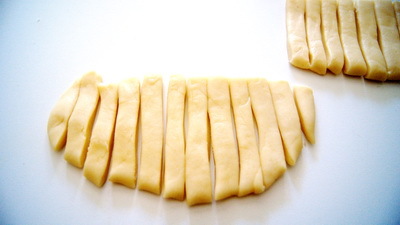 Cut the bread 1/3 inch gaps like picture. 5. Heat the oil on medium heat and fry the flour stick till those become light golden. 6. Remove those from oil into paper towel. Repeat the process to finish all flour sticks. 7. Heat a separate pan with sugar and water. Boil about 2-3 minutes the syrup thickens and becomes sticky. 8. When white bubbles start to show from bottom, add the fried flour sticks and stir constantly on low heat so that all crackers are coated. Turn off heat when syrup starts crystallized. let Goja / khurma cool down. 9. 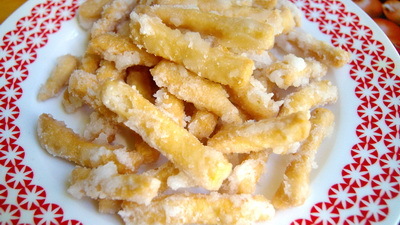 Serve Goja / khurma as a snack. Tips: Let it cools down before store it. Hi Apa,i have a question for you.i love all your recipes.I made these,they had come out really nice but little flat like nimki,so how thick should I roll the dough to get the way you did? Hi! it needs to be rolled about 1 cm or .4″ thick. Hope next time will be perfect. Thanks. How long we have place goja in syrap after turn off the heat? After turn off if you have syrup then you will not get good Goja / khurma. syrup needs to turn as crystal. When syrup turns into sugar crystal, turn off the heat. and pour Goja / khurma in a dish. Am I clear? Can i use all Purpose flour instead of Plain flour?